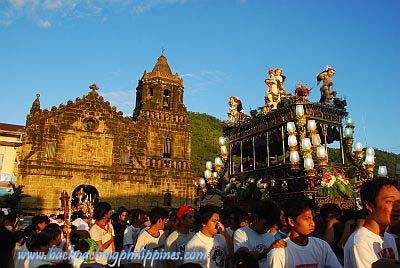 As asked countless of times on this blog on how to get to Paete (Tutubi's hometown) either to buy wood carvings, get in touch with artists (painters, ice carvers, chefs), climb Tatlong Krus and waterfalls, spend Holy Week or for other reasons. View this Map of Paete, Laguna for a visual presentation of directions when you zoom in. either of these buses will take you to Sta. Cruz, Laguna where you can ride a jeepney with signboards either Paete or Siniloan to take you to Paete. Directions by car from Quezon City, it's faster to take the Rizal route by going to Marcos Highway, turn right at the junction Masinag Wet and Dry Market, on reaching Antipolo intersection turn left going to Baras (straight ahead leads to Antipolo Church while a right turn leads to Hinulugang Taktak) where you'll pass by Teresa, Morong, Baras, Tanay, and Pililla towns of Rizal province before reaching Laguna towns of Mabitac, Siniloan, Pangil, Pakil, then Paete. Follow only the highway in getting there where you'll pass the zigzag road of Manila East Road with great views of the shimmering Laguna de Bay.